Milieu is a brand of unique handcrafted illustrative products by Eeshita and Tushar. A splash of color, a dash of intelligence, a moment of inspiration, a heap of passion and a load of love encrusted within a thick layer of patience defines Milieu. Each of our products is created out of passion for reshaping the tradition. While we strive to conserve traditional crafts like hand embroidery, quilling, shanji art etc., we endeavor to bring a modern twist to it by adding wit and humor to the subject. We pair tradition with non-tradition to deliver happiness to you. Since each product is uniquely handcrafted for you, they might differ slightly from the picture posted. But that difference makes your product unique in the way such that the particular piece of Milieu is only meant for you and shall never be possessed by anybody else in the world. 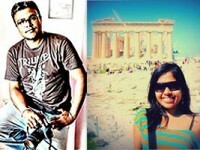 Eeshita is a scientist turned artist and Tushar is a cinematographer. We create differently illustrated home decor and wall art using traditional crafts like hand embroidery, paper quilling and mixed media. Coming from different fields of life, we use our visions to modify the subjects with our wits and humor. We draw on our experience of living and traveling through different parts of the world to create our art. We strongly believe in keeping things green and close to nature. Products shall be shipped within 6-8 days through reputed couriers only. Still if you receive a product that has been damaged/broken in transit, please reach out to us immediately with pictures of the damaged piece and corresponding details and we will fix it. Some products can be personalized. Do get in touch with us if you need something to be personalized and we will see what we can do for you.